Can forests thrive in the world of carbon trading? CNN -- So few forests remain in the tiny country of Armenia that the World Bank has warned it could one day become a desert. 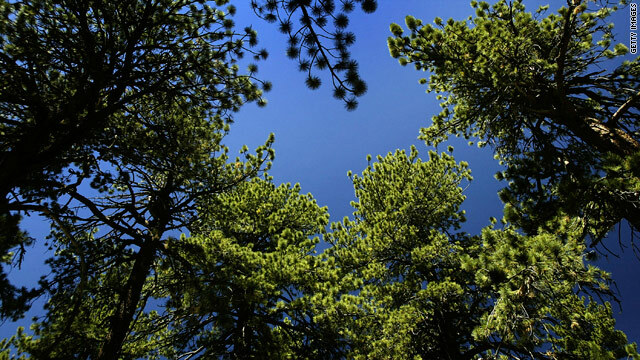 For more than 15 years the Massachusetts-based Armenian Tree Project has been replanting the country's forests lost during its energy crisis in the early 1990s. Recently the group, like many similar organizations, has considered raising funds by selling carbon credits. But questions persist over whether applying carbon finance to forestry projects can be good for the environment as well as for the communities where the trees are planted. "The thing about forestry and carbon, obviously it is very new, and it is complicated," said Jason Sohigian, deputy director of the Armenian Tree Project. "The reason why people want to invest in it is they understand trees and carbon have a relationship, so it is easy for the public to make an association between climate change and trees." Deforestation is responsible for up to 20 percent of greenhouse gas emissions worldwide, according to the United Nations. Yet forests also absorb huge amounts of planet-warming carbon dioxide, which can be quantified and bought as credits by companies and countries to offset their pollution. Currently carbon offsets purchased from reforestation projects represent only a fraction of global carbon markets. A reason for this is that few projects have gained approval by the Clean Development Mechanism, an arrangement under the Kyoto Protocol that allows industrialized countries to buy carbon credits from projects in developing countries. "The verification process is quite rigorous to go through and satisfy the questions, especially on how you measure emissions," said Alexander Rau of the Helsinki-based Climate Wedge, a carbon management and investment advisory firm. The European Union's Emissions Trading System also has a ban on buying forestry offsets from developing countries. Growth of forest offsets now largely depends on whether the U.S. passes legislation prioritizing forestry as part of a federal cap-and-trade market. And while climate negotiations in Copenhagen last December did not result in a legally-binding global pact to cut greenhouse gases, there was significant political and financial support of a UN plan to reduce emissions from deforestation and degradation (REDD). However, for small non-profits like the Armenian Tree Project, the cost of even becoming certified on voluntary markets is prohibitive. "That is one of the problems with forests," Sohigian said. "With most systems, you don't get the money until after you sequester the carbon. So how do you even get off the ground without the money up front?" Once a project is certified, revenue generation can still be difficult. For one, the price of offsets in voluntary markets is significantly lower than those traded in regulated markets, which means more trees will have to be planted to make money. Projects will often sell credits in advance based upon the projected amount of carbon the trees will absorb over time but "the risk is very big," said Jutta Kill of FERN, a Brussels-based environmental group. "You have a lot of obligations for a very uncertain return of revenues," said Kill. "Some involve signing a very long-term contract, guaranteeing your trees will be standing for the next 100 years." If something happens to the trees, the communities and organizations that have planted them will sometimes be responsible for replanting them or will have to buy offset credits from other projects to supplant what was lost, said Kill. This possibility adds more cost concerns. It's the Wild West mentality of carbon offsets. There are no rules right now. "Most of the contracts are not public, which puts a lot of the communities at a disadvantage," Kill told CNN. "They have no way to know whether they are being offered a fair deal." "When you have a project that involves local communities, it is interesting to see if it would benefit or if it would suffer from presenting itself as a carbon project," Kill said. Sohigian said the Armenian Tree Project has worked hard to engage the support of villages in their endeavor, starting poverty alleviation programs and environmental education initiatives in combination with their efforts to replant trees across the country. Becoming an offset project could mean they have to refocus their efforts to measuring the carbon absorbed by the forests, diverting attention away from the people who will be crucial to ensuring the trees are not cut down in the future. "If you are helping families and reducing poverty, that reduces pressure on forests and increases the likelihood the forests will be able to survive," Sohigian said. An article published in "Science" in early April warned REDD could place forest management in the hands of governments, reducing the rights and responsibilities of local communities charged with managing the trees. Some critics of the forestry and carbon offset schemes suggest that because voluntary markets are unregulated, such projects also are susceptible to fraud. "I call it the Wild West mentality of carbon offsets," said Scott Jones, executive director of the Forest Landowners Association, a U.S.-based group that lobbies for private landowners rights. "There are no rules right now, so if you can figure out a way to go make money and show social responsibility, then go ahead." Others are more optimistic about the future of carbon offsetting and forestry. "This is an evolving market and mistakes will be made," said Jim Lyons, a lecturer at Yale University's School of Forestry and Environmental Studies and former under secretary for natural resources and the environment in the Clinton administration. "I feel confident smart people can work out the details, and the market will evolve into a market that will prove much more viable than the existing market for cutting down trees," Lyons said.